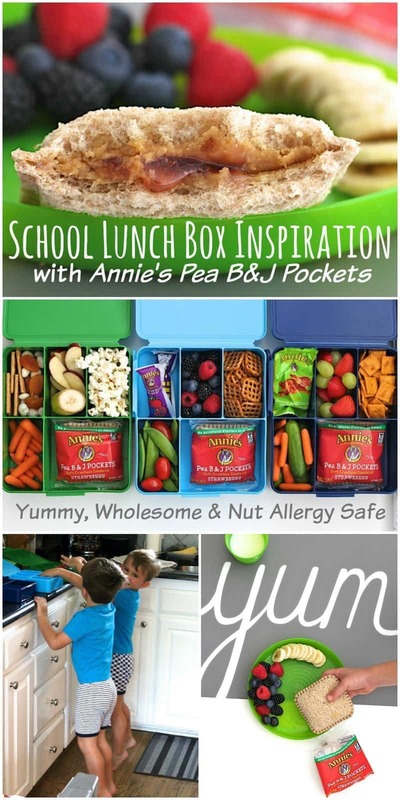 Pack a wholesome, safe and yummy school lunch for your little one with these great lunch box ideas featuring Annie’s New Pea B&J Pockets! Happy back-to-school time! I know it’s a bittersweet time for all of us as the lazy days of summer come to an end and the crazy scheduled days of the school year begin. Baker started kindergarten last week and I still can’t believe it. Why do they have to grow so fast?! He’s so excited to be a “big” kindergartener now and we’re so excited for him! The twins moved up to the PK3 class at their little school and bless their sweet teachers. They’re more than a handful, but they’re happy and healthy and that’s what matters most. They love school too, so it was an exciting week for all! Now that Baker’s in kindergarten, he has to be in his classroom and ready to go by 8:15am. Not a minute late or we’re in the principal’s office getting a tardy slip. Yikes! I’ll admit I wasn’t highly motivated to get them there on time when they were all in preschool because it’s preschool after all and the stress of trying to get everyone up and fed and dressed and lunches packed and snacks ready and everyone/everything loaded in the car everyday was a lot given how unpredictable life can be with toddlers and babies so I let it slide quite often and it was okay. Well, it’s not okay this year so I have to have my act together every morning. Baker does not like to be late and I would hate to disappoint or embarrass him. So gone are the mornings of me leisurely drinking my coffee, finishing up a blog post, watching one more segment of the Today Show, etc. etc. From the moment my alarm goes off at 6:30am, it’s go time! Before the school year started, I thought of ways to make our morning routine as quick and easy as possible. 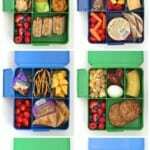 Like laying out their clothes the night before, keeping easy-to-prep and easy-to-eat breakfasts on hand, having their lunch boxes out ready to be packed and everything that goes in the lunch boxes convenient to grab and pack into them. Well, so far so great! We’ve actually been early almost every day and I can’t tell you how proud I am of us, okay me. Haha! 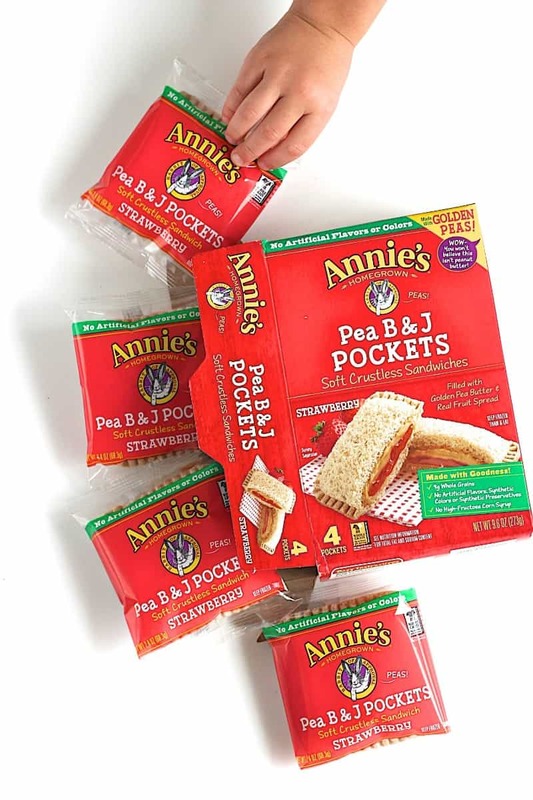 A huge timesaver for me has been packing these New Annie’s Pea B&J Pockets in the boys’ lunch boxes! They LOVE them! 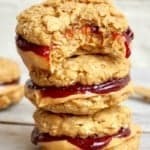 They’re so yummy, made with simple, wholesome ingredients and most importantly safe for them to eat at school around their friends who have nut allergies. 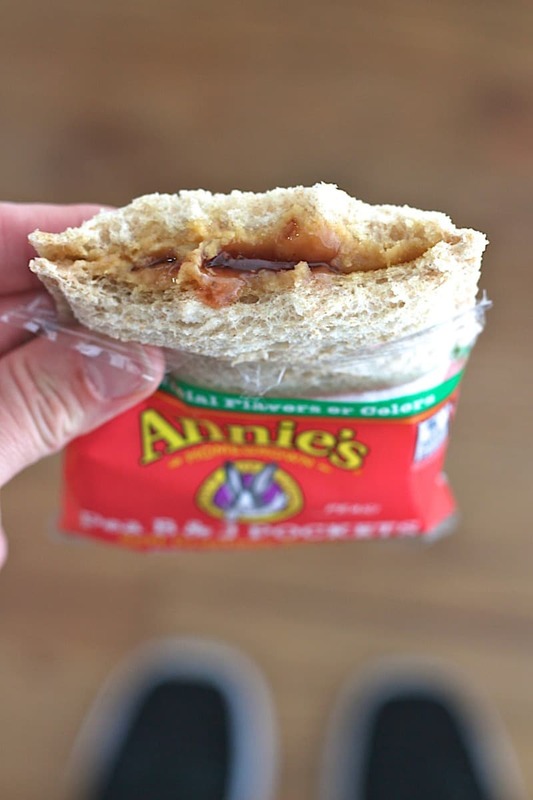 Prior to discovering Annie’s Pea B&J Pockets, the boys’ most requested lunch was a classic peanut butter and jelly sandwich. 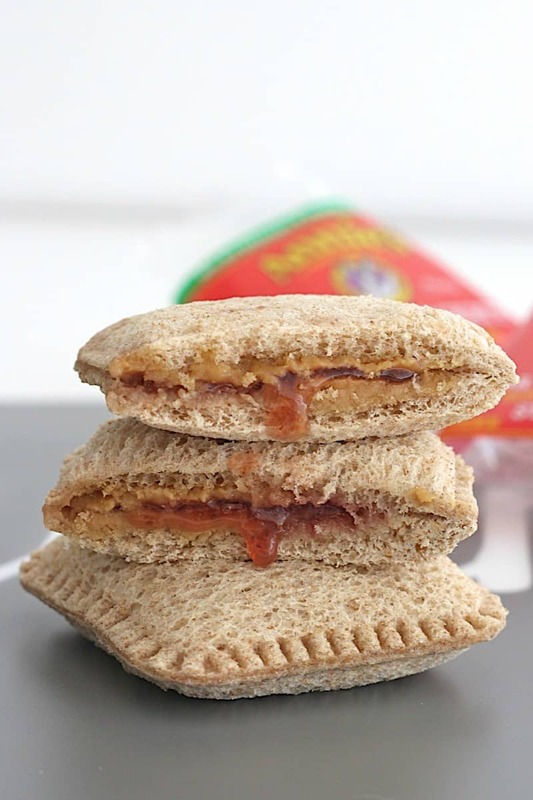 Sure, a PB&J is easy to make, but it still requires me pulling out the bread, peanut butter and jelly and then assembly line making and cutting three sandwiches to go in their lunch boxes. 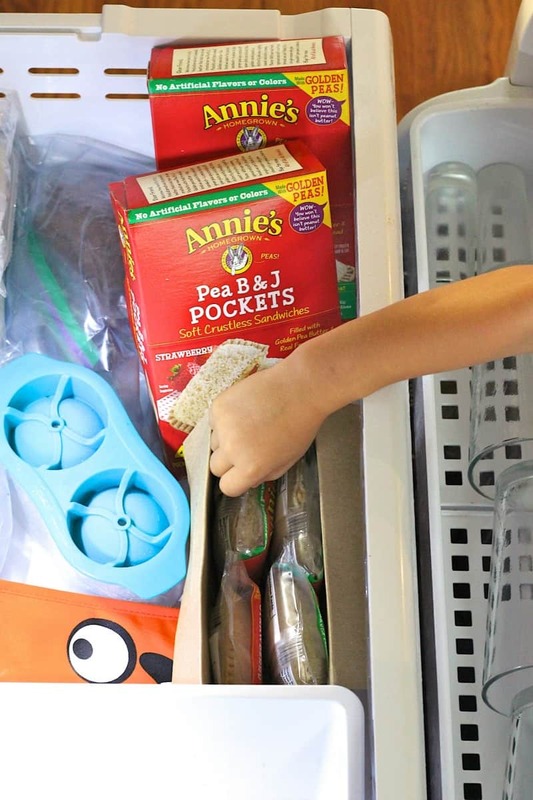 With the Pea B&J Pockets, we keep a stock in the freezer that we can grab and put into their lunch boxes in a matter of seconds and the boys can do it themselves. Woo-hoo! 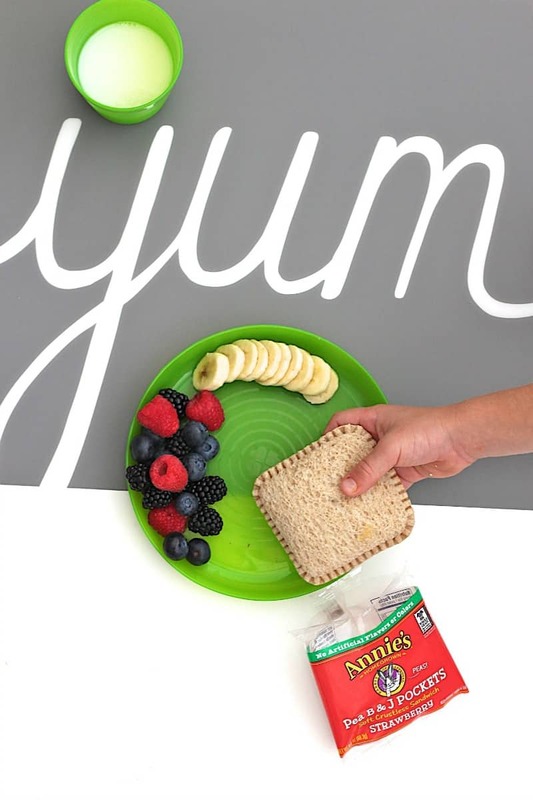 As much as I love the convenience of packing these pockets into the boys’ lunches, I love even more that they’re safe for the boys to eat near some of their best friends who are allergic to nuts. I’ve always been hesitant to pack the boys peanut butter sandwiches because I know that when I do they can’t sit near their friends who have allergies and that’s so sad. I want the boys to love and actually eat what’s in their lunch, but I also want them to be able to have a fun lunch with all their friends together. These pockets are made with golden pea butter instead of a nut butter and it’s delicious, y’all! I’d never even heard of golden peas and now I’m hooked. 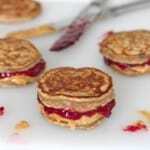 Definitely different in taste from peanut butter, but very tasty and compliments the jelly so great. 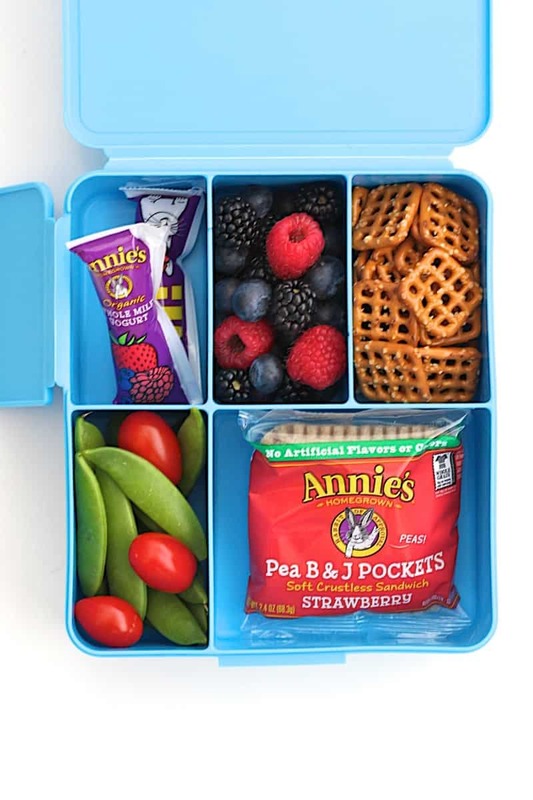 In fact, Annie’s golden pea butter recipe was actually inspired by The Sneaky Chef’s® “No-Nut Butter,” who is notorious for sharing simple strategies for hiding healthy foods in kids’ favorite meals. Love it! Once the pocket defrosts (in just an hour! ), the crustless whole wheat bread is super soft, the golden pea butter is creamy and the sweet jelly oozes a bit with every bite. So yummy! 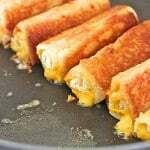 With 9 grams of whole grains as well as some good protein and fiber in each pocket, they’re satisfying and energizing. 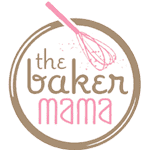 They’re made without artificial flavors, synthetic colors, synthetic preservatives or high-fructose corn syrup. 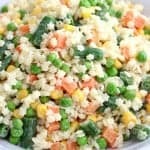 A food you can feel good about feeding to your kids! 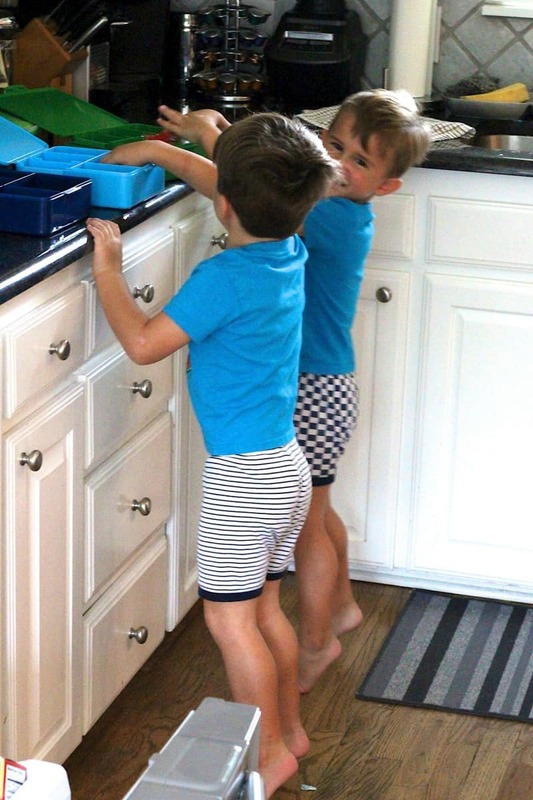 We mainly pack them in the boys’ lunch boxes, but ever since we discovered them, we also eat them for breakfast occasionally and as a snack every once in a while. I’ll even set one out when I wake up so it’s defrosted by the time we’re walking out the door for an on-the-go breakfast that gives me great energy for a good workout after I drop the boys off at school. 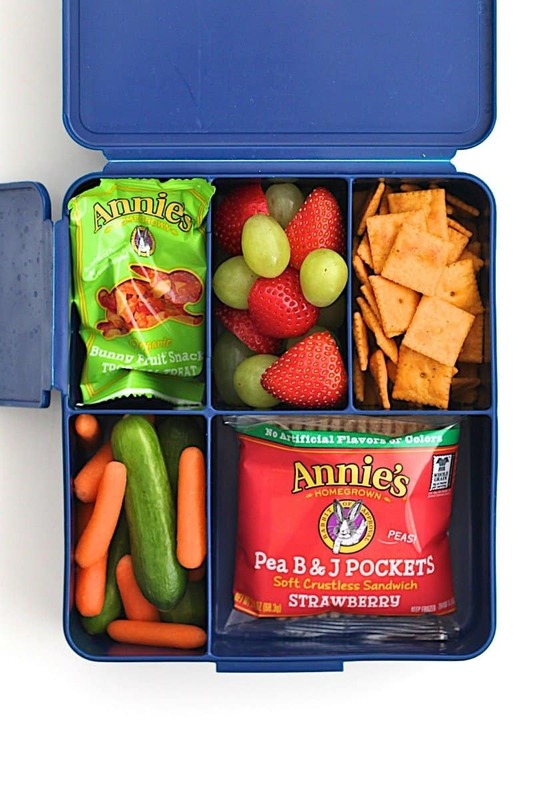 Below are some of our favorite lunch boxes with Pea B&J Pockets as the main. 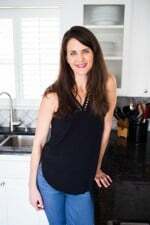 I try to wash all the fruits and veggies on Sunday so they’re ready to go for the week and then keep a good stash of pantry sides that I can easily pull out to pack along with the pockets. With a little prep on Sunday, I can pretty much pack their lunches in my sleep throughout the week. I wish, but this has made all the difference in the speed of our morning routine. 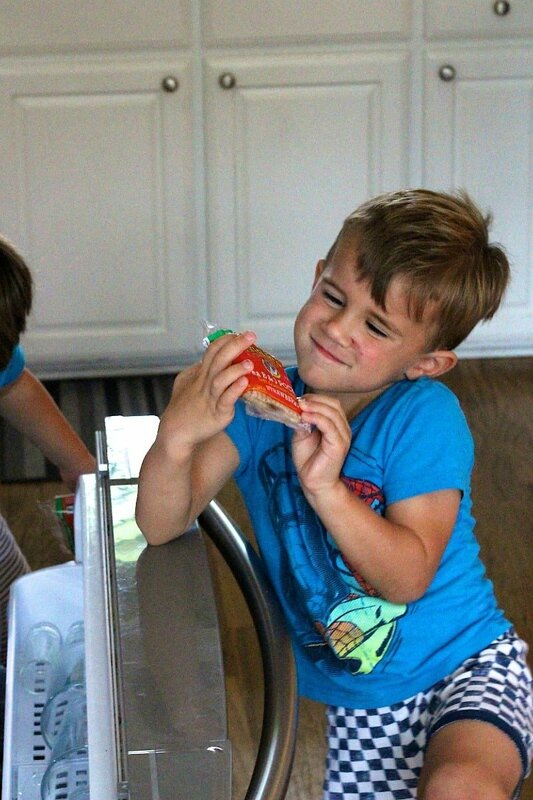 I’m so glad we discovered these Pea B&J Pockets and that the boys love them! You can find them in the frozen aisle at Target in strawberry or grape varieties. 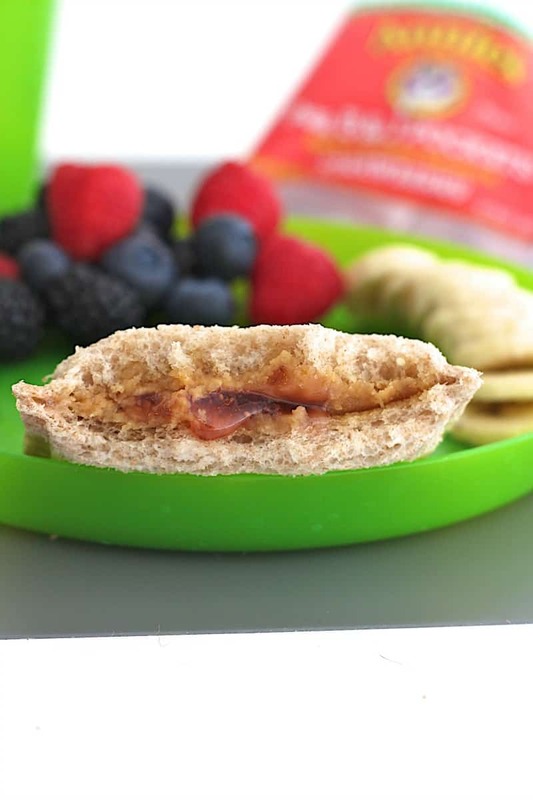 Whether your little one has a nut allergy, your school has a strict nut policy or you just want to pack a healthy and safe lunch for your kid to enjoy at school, these Pea B&J Pockets are perfect! I hope you enjoy them as much as we do and that they make your life a little easier throughout the school year. This post was created as part of my partnership with Annie’s however all thoughts and opinions are certainly my own! Thanks. 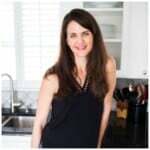 I love your posts helps so much with me getting dinners and snacks etc. 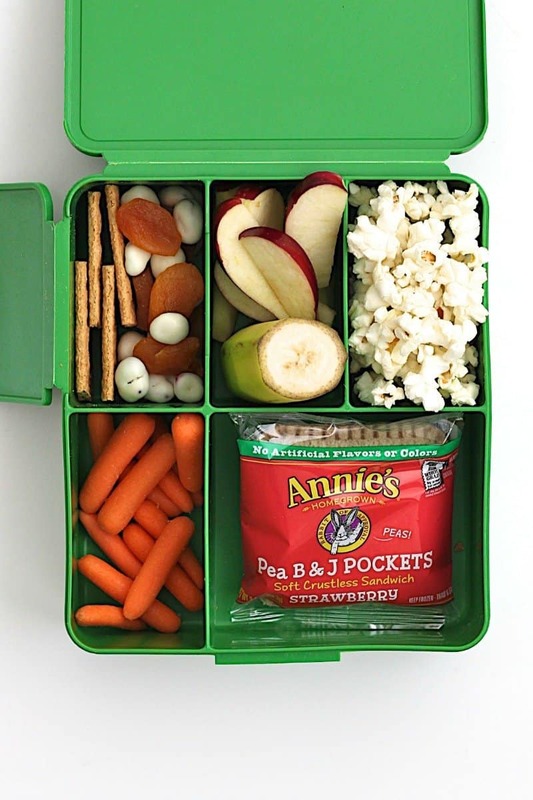 Where did you purchase lunch box love the dividers. Keep the great posts coming. Hi Karen! Hope y’all are doing great! We got the lunch boxes from Pottery Barn Kids. We’ve had them for 3 years now and love them so much! Great for dividing the food and easy to wash in the dishwasher. Two thumbs up!